I always shoot many more pictures than I can use in posts so I’ve assembled the extra church pics into short videos and uploaded them to my YouTube channel. You get to see contextual views of how and where the building sits, shots of it from many different angles and some sound to accompany the vision. I have featured all three churches in blog posts. Click on the church name to read my blog post. Click picture to watch the video. On this day, the most humble of churches. 1897 and 1898 were busy construction years in Griswold, west of Brandon on #1 Hwy. 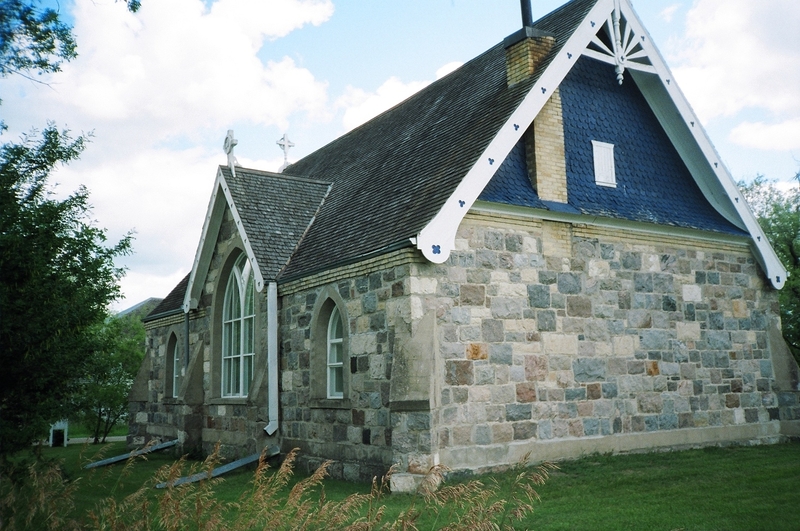 Both the school and this church were built in those two years. Griswold United, similar to small parish churches dotting Scotland and England, is a Hobbit-like place tucked away in a sleepy little hamlet slowly being dusted away by the prairie wind. Around it are towering protective trees that lean in mothering mode toward this elaborate pile of stones. Earth hugging, it feels like the rocks rose right out of the ground, shook off the sod and assembled themselves into this expressive and timeless heap. The deep-set windows have simple tracery. Study the rear wall in this picture. It is a mass of solid fieldstones, unbroken by an opening. Notice the myriad of colours of the stones, a patchwork quilt of geological time. The gable ends of this church are adorable. The vibrant blue fish scale shingling under the eaves sets off the stark white bargeboard with its small triceps that culminate in the sunburst pendant and the cross finial creating a sensation of ascension. Every elevation has some form of buttress to support the enormous weight of the fieldstones. This is a very ancient sacred site. Watch my short video about this church.